She is a person who is willing to do anything to capture Pokémon for her clients even if it means injuring people or Pokémon, easily revealing her to be ruthless, relentless, and cruel. 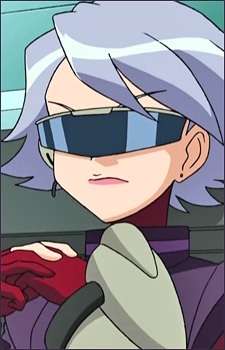 In fact, in her debut episode, she sacrificed some of her henchmen to Officer Jenny without hesitation or remorse, emphasizing her sociopathic and callous nature. J appeared again in DP150, where she was hired by Team Galactic to catch Uxie, Mesprit, and Azelf. She also appeared in DP151, attempting to carry out the task of capturing them. Although she did succeed in capturing the Lake guardians, her ship was hit by two Future Sight attacks used by Uxie and Mesprit after she handed them over to Saturn. As a result, her ship crashed into Lake Valor and was sucked into a whirlpool while she and her crew members were on board. Once the ship was underwater, the protective glass broke and the ship was flooded with water, causing it to explode. It is currently unknown if J or any of her crew survived.